As the holding company of two power entities, SMN Barka and Al Rusail, SMN Power Holding SAOG combines 1,343 MW of power and 120,000 m3/day potable water capacity. The business model of both project companies held by SMN Power Holding SAOG, i.e. SMN Barka Power Company SAOC and Al Rusail Power Company SAOC, is based on a strong contractual framework, with solid and reliable partners. Back-to-back contracts significantly reduce the risks over a long-term period. The supply of the output to the off-taker OPWP, the gas supply from MOG, the operation and maintenance of the plants by the operator STOMO and the financing of the project, are all guaranteed over a long-term period of 15 years for SMN Barka and 17 years for Al Rusail. Over this 15-year period (17 years for Al Rusail), ending in March 2022 for Al Rusail and March 2024 for SMN Barka, the project companies are remunerated for their capacity and availability. Their profitability and ability to generate cash flows are independent of market fluctuation, commodity prices and market demand throughout the PWPA term. The plants are operated and maintained under the terms of the O&M agreement with STOMO. The highest standards in terms of health, safety and operational excellence are applied, to ensure availability and efficiency. Interest rates volatility and impact on the financing expenses are mitigated through adequate hedging policies, in line with the requirements defined by the lenders in the Facility Agreements. Finally, the Company is benefiting from the strong track records of its original founders, reflected in the high level of experience of the Board of Directors, bringing significant value to both projects. On 2 November 2005, the Government invited proposals for the development of an Independent Water and Power Producer (IWPP) at Barka and the privatization of Al Rusail (Tender No 210 / 2005). In 2006, the Founders (Suez Tractebel S.A.; Mubadala Development Company PJSC and National Trading Company LLC) secured the award from OPWP following a competitive bidding process. The project has been established under a BOO (“Build Own Operation”) scheme. The BOO concept enables the Founders (through the operator) to operate the Plants beyond the project horizon of 15 years by either extending the P(W)PA (if agreed to by OPWP) or by selling into an electricity pool which may exist at that time. The Founders incorporated SMN Power Holding Company Ltd (“SMN Jafza”) for the purpose of holding the shares in both Project Companies and for undertaking the Project through the Project Companies. SMN Barka is an IWPP plant situated at Barka. 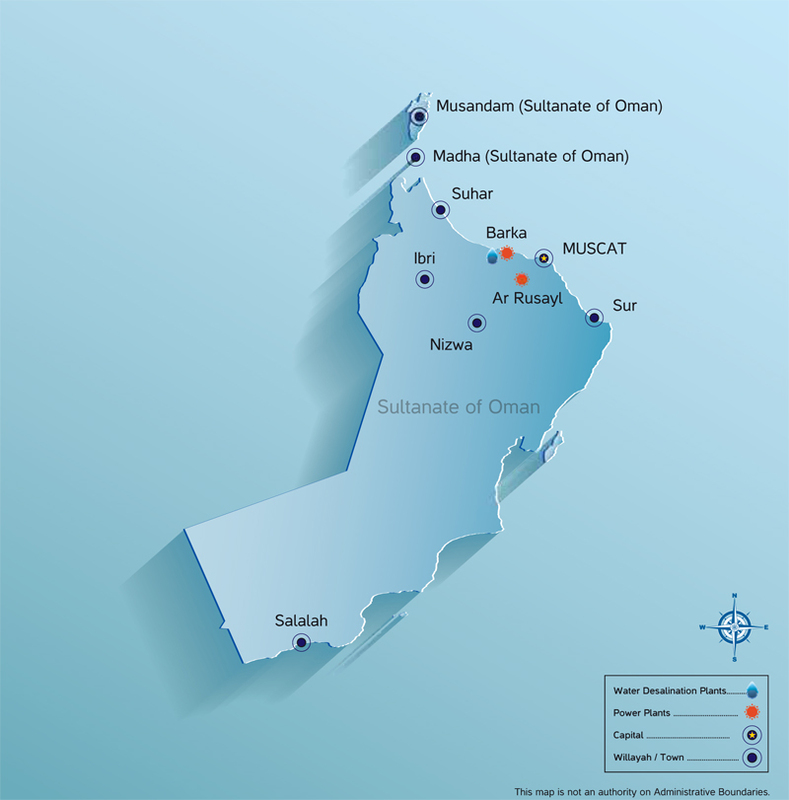 The site is approximately 50 km northwest of Muscat, Oman. Also popularly known as Barka II / Barka Phase 2, the design net rated power output of the facility in a combined cycle mode is 678 MW and 363 MW in open cycle. The water production capacity is about 26.4 MIGD or 120,000 m³/day. The facility entered into full commercial operation on 15 November 2009 and commenced the fifteen-year PWPA, guaranteeing the sale of its electricity and potable water capacity and production to OPWP. Al Rusail is a natural gas-fired 665 MW power plant, the first state-owned power generation company to be privatized in the Sultanate of Oman. In December 2006, the shareholders acquired the shares of Al Rusail from the Government, (through acquisition of 99% of the shares in Al Rusail by SMN Jafza). The plant is located inland, approximately 40 km west of Muscat in an industrial area. It consists of eight Frame 9E gas turbines installed in four phases between 1984 and 2000. Al Rusail’s primary fuel is natural gas supplied by MOG, but diesel oil is also stored on site to serve as a backup fuel. Power capacity and production are sold to the OPWP under the 17-year PPA ending in March 2022. The Project Founders’ Agreement (“PFA”) requires that the Founders float 35% of the shares in the Project Companies on the MSM through an IPO. It was envisaged that an Omani SAOG was to be established for the purposes of fulfilling the obligation to undertake an IPO, which SMN Jafza could not satisfy since it is a JAFZA company incorporated in the United Arab Emirates. Following the incorporation of the Omani SAOG, the Founders were to ensure that all of the rights, title and interests of SMN Jafza are simultaneously transferred to the Omani SAOG and all of the obligations and liabilities of SMN Jafza are be simultaneously assumed by the Omani SAOG. It was agreed in October 2010 between the Founders to allow for a two-step approach comprising (i) the incorporation of an SAOC and (ii) the transformation of the SAOC into an SAOG at the time of the IPO and the Electricity Holding Company approved the agreement. The IPO of SMN Power Holding, the only IPO in Oman in 2011 and one of the very few in the region that year, attracted strong interest from investors and the issue collected RO 40.9 million against the target size of RO 24.6 million. Accordingly, the issue was subscribed 1.7 times. Following the IPO, 35% of the shares of SMN Power have been listed since 23 October 2011 on the Muscat Securities Market.